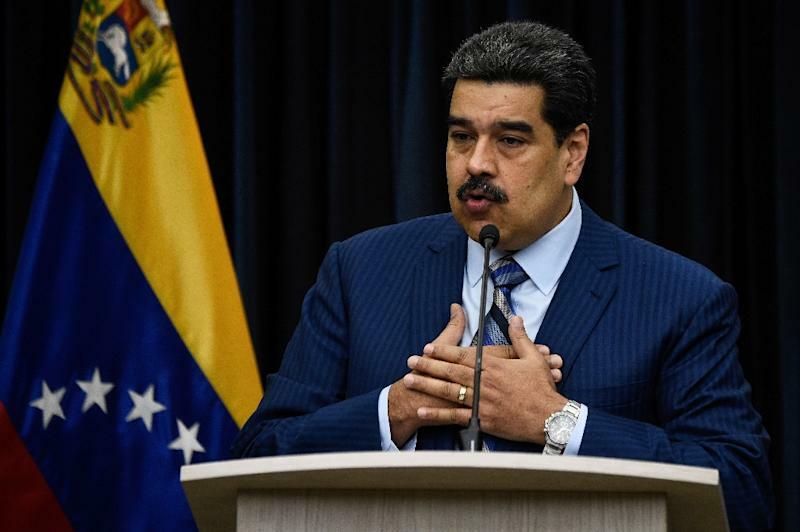 Caracas (AFP) - Venezuela President Nicolas Maduro hit out at his regional detractors on Wednesday, threatening to take "diplomatic measures" against them if they refuse to acknowledge his re-election. Maduro is due to be sworn in for his second term on Thursday, after winning a highly controversial snap election last May. Last week, a band of 14 countries from the Americas, known as the Lima Group, called on Maduro to step down and hand power to Venezuela's sidelined, opposition-controlled parliament ahead of "democratic elections." At a press conference, an angry Maduro slammed the "interventionist and rude policy" of the Lima Group and vowed to "defend the national interests." He warned his government would "take the most immediate and crude diplomatic measures" should those governments fail to change their position on Caracas "within 48 hours." Maduro accused the bloc of paying lip service to the United States and was particularly angered by the Lima Group's support for Guyana, one of its members, in a territorial dispute with Venezuela. The Lima Group's declaration -- signed by 13 of its 14 members as Mexico abstained -- rejects any "provocation or military deployment" by Venezuela that could "threaten peace or the region." It also called on Maduro to refrain from "acts that violate the sovereign rights of his neighbors" -- a reference to the Venezuelan navy's interception last month of two vessels doing seismic studies for US oil giant ExxonMobil in an area that is disputed by Caracas and Guyana. On Thursday, Maduro will be sworn in by Venezuela's Supreme Court, rather than parliament, as is customary. He won a snap election last year that was boycotted by the opposition and branded fraudulent by the US, European Union and Organization of American States. Since then, he created a Constituent Assembly made up of regime loyalists to replace the elected National Assembly that he had lost control of in 2016. While the National Assembly still sits, all of its decisions are annulled by the Supreme Court, which is also made up of Maduro allies. The National Assembly nevertheless has declared that it remains the only legitimate institution in Venezuela, and that it would instill a "transitional government" ahead of new elections. However, Maduro has the backing not just of the Supreme Court and Constituent Assembly, but also the armed forces, which issued a statement on Tuesday declaring its "unrestricted support and absolute loyalty" to him. His detractors blame him for Venezuela's economic woes, which have left millions in poverty while another 2.3 million, according to the United Nations, have fled the country since 2015. Those remaining behind face shortages of basic necessities such as food and medicine, as well as failing public services including water, electricity and transport. Venezuela was badly hit by the global crash in oil prices in 2014. The country is almost entirely dependent on crude but its production is now barely a third of what it was a decade ago. That shortfall has contributed to spiralling inflation that reached 1.35 million percent in 2018 -- and which the International Monetary Fund predicts will hit a staggering 10 million percent this year.